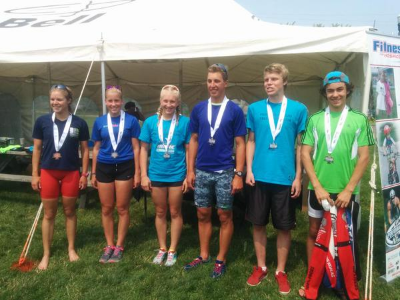 Triathlon Ontario hosted the first Youth Cup for age group, Junior, Elite/ U23 at the Belle River Triathlon on Sunday. It was the first qualifier for 2016 Ontario Summer Games in Mississauga. Alexander Hinton (NTC Guelph) lead the race from the gun, running a sub- 15 minute 5km for the win. Jackson Laundry was second silver and Reid Burrows took third. Guelph National Training Centre athlete and coach with Loaring Personal Coaching Alexandra Coates won the women’s race. Former Pan Am medalist and recent Age Group Provincial Champion, Kirstie Kniazew took second and Meghan Lamers took bronze.The Series will come to a completion in Ottawa for the Draft Legal Provincial Championships where there will be additional points on the line and the $2,000 prize purse will be decided. This race also is an important points race for Quest for Gold funding as well as Provincial Development Team selection. Be sure to register soon! Aaron De Jong came out of the water with about a 20 second lead over Jacob Jamnicky (Provincial Development Team) but Jamnicky put the rode and ran him down for the win. De Jong finished in second and Junior Liam Donnelly was third.Elise Bolger (Provincial Development Team, Quest for Gold) lead out of the water and was able to work together on the bike with the lead from the Elite/U23 division (same wave) to ensure she was well-positioned for the run. Erika Rankin was second and Danae Morris was third.The Series will move to Ottawa for the Draft Legal Provincial Championships for the third installment. In addition to extra points in the Series, this race also is an important points race for Quest for Gold funding as well as Provincial Development Team selection. Congratulations to the following that have secured their spots in Mississauga next year for the Ontario Summer Games! The next opportunity to qualify for those interested in participating is the Draft Legal Provincial Championships. The top 5 finishers that have not already qualified will earn qualification. For more information please visit: http://www.triathlonontario.com.